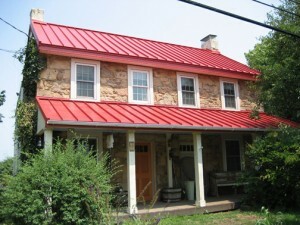 There are many reputable and independent studies showing that Energy Star qualified roofing systems can decrease the surface temperature of a roof by up to 100 degrees Fahrenheit during the summer hottest months, which can significantly reduce the amount of solar radiant heat being transferred inside your home, and thereby reduce your air conditioning costs by 20 to 40%. Ask any roofing replacement contractor whether or not old asphalt shingles can be recycled, and they will tell that there is no real way to recycle them. Metal Roofs, on the other hand, are fully recyclable, and are often made from recycled metal to begin with. Not only that, metal roofs can last two to three times longer than asphalt. They look much sharper, increase the resale value of your home, and give you a real peace of mind that no other roofing system ever will. Residential metal roofing is never claimed to be cheap, but your actual cost will vary based on your geographic location. If you want an affordable option, then you should always go for steel or aluminum shingles. Both, G-90 Galvanized steel and aluminum are known for their strength, longevity, and exceptional durability. There are also premium metal roofing materials to consider; copper, zinc and stainless steel, but these will always be significantly costlier than a more affordable galvanized/galvalume steel, or aluminum roofing options.